STEVEN S. LITTLE is a renowned speaker, writer, and consultant on the subject of small business growth. He is the former president of three fast-growth companies and has been a senior consultant for Inc. magazine since 1998. During his speaking and consulting career, he has worked with some of the country's most admired organizations, including UPS, Sprint, Bank of America, Compaq, Microsoft, and the Small Business Administration. Preface: Did I Really Say “Irrefutable”? 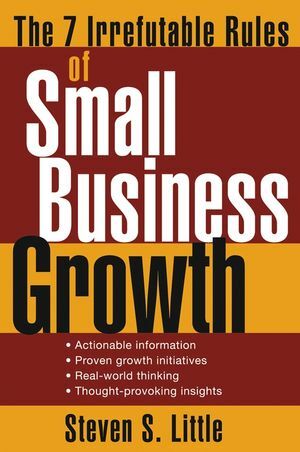 Chapter 1: A Realist’s View of the Small Business Landscape. Chapter 2: Are You Really the Entrepreneurial Type? Chapter 3: RULE 1: Establish and Maintain a Strong Sense of Purpose. Chapter 4: RULE 2: Thoroughly Understand the Marketplace. Chapter 5: RULE 3: Build an Effective Growth Planning System. Chapter 6: RULE 4: Develop Customer-Driven Processes. Chapter 7: RULE 5: Put the Power of Technology to Work. Chapter 8: RULE 6: Attract and Keep the Best and the Brightest. Chapter 9: RULE 7: See the Future More Clearly. Appendix: Personality Tests That Measure Entrepreneurial Types.